In case you haven’t noticed, when we’re not brunching over here, we’re spiralizing. Last year, a friend introduced me to this life changing kitchen gadget called the spiralizer, which transforms any vegetable into a noodle-like shape, turning what would be a carb loaded dish into a fibrous feast. 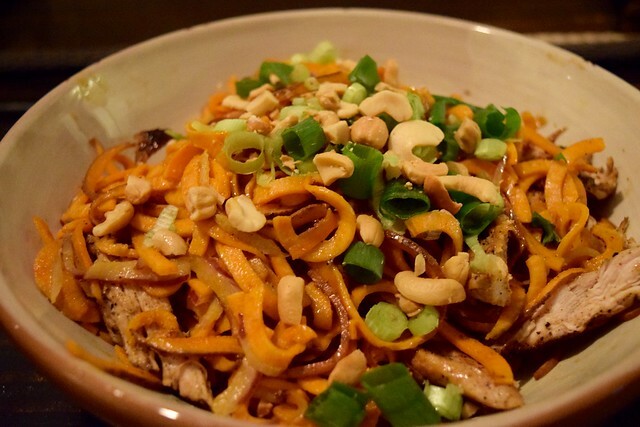 One of my go-to spiralizer recipes is Paleo Pad Thai, a guilt free twist on our favorite, convenient takeout dish. With this version, you’ll feel like you’re indulging in the comforts of traditional pad thai, but you’re actually consuming a gluten-free, dairy-free, low-sodium meal that can be whipped up in 15 minutes. An initial nonbeliever, my fiance now requests this dish on a weekly basis and claims if entered into a blindfold taste test, you wouldn’t be able to tell the difference. Enjoy this quick, healthy weeknight meal that’s sure to satisfy your cravings! Cut off the ends of your sweet potatoes and zap them in the microwave for a minute to soften. 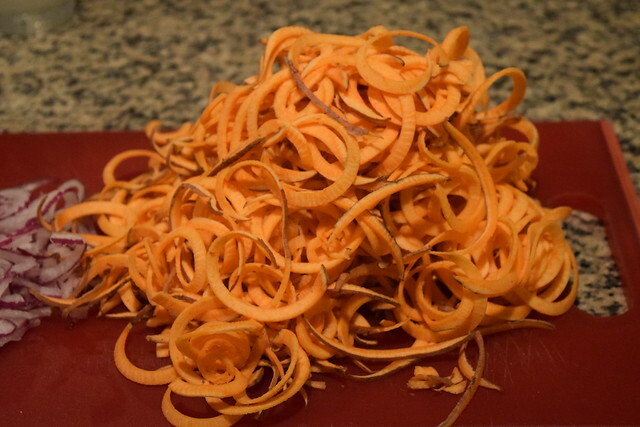 Using your spiralizer, turn your sweet potatoes into noodles. Place your “noodles” aside. Sprinkle with a pinch of salt, pepper and garlic powder on your chicken breasts before placing on a grill pan. 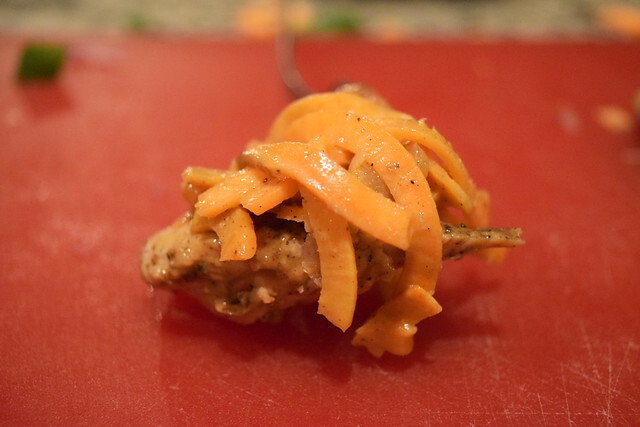 Once fully cooked, shred the chicken into pieces with a sharp knife. Place your sweet potatoes in a covered pot on the stove setting the temperature to medium heat to soften. Combine the Amino Acid, almond butter, anchovy paste, olive oil and crushed garlic into a small bowl. Stir until smooth. Add in the lime juice and onion powder along with pepper to taste. Add the cooked chicken to the sweet potatoes on the stove and mix in the sauce until all the ingredients are lightly coated (I usually reserve a little sauce to sprinkle on each individual plate before serving). Before plating, crush the nuts and thinly slice the scallions to top off your dish. 10. Plate each serving individually and top it off with a pinch of scallions, nuts, extra sauce, a sprinkle of sesame seeds and a squeeze of lime. Sit back and let the compliments flow. Recipe adapted from Brittany Angell. I tried this with a bushel of scallions but think a peck would be enough.